American Diplomat Calls Ahmadinejad The "George Steinbrenner Of Iran"
In a State Department document released by Wikileaks, an American diplomat is credited with referring to Mahmoud Ahmadinejad as the "George Steinbrenner of Iran." The official was referring, of course, to Ahmadinejad's dealings with the country's national soccer team, and his attempt "to use the popularity of Team Melli to improve his standing with the Iranian people ahead of the 2009 elections." The President also reportedly used his influence to fire two Melli coaches in two weeks; The Boss changed team managers 21 times in over 37 years as owner of the Yankees. Steinbrenner, who died in July at age 80, now stands in imposing copper and tin in Tampa and The Bronx. His son Hank called the comparison "ridiculous" and "very inappropriate." The parallels are certainly weak — the AP article cites the fact that Iran is a part of the junior President Bush's "axis of evil," and opposing fans called Steinbrenner's operation the "Evil Empire." That is slightly ridiculous. 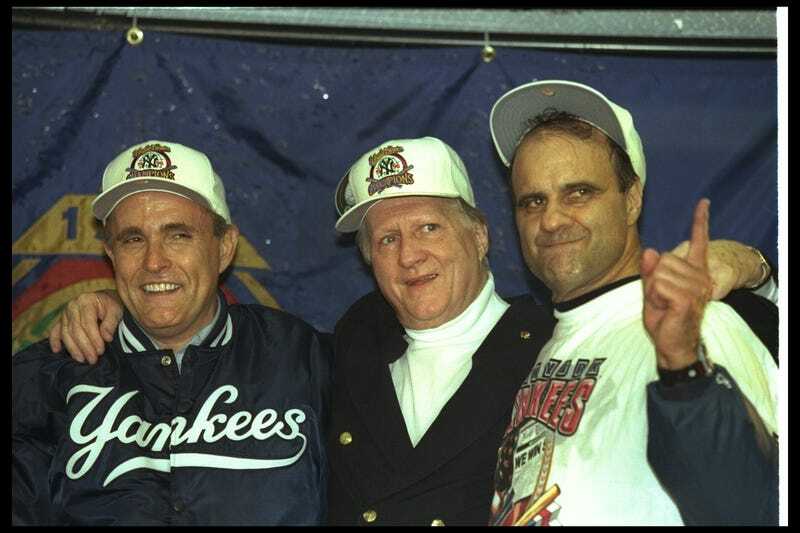 But help me on this one: if Ahmadinejad is Iran's Steinbrenner, and Sarah Palin is America's Ahmadinejad... what exactly does that make Steinbrenner?